year. Pruning opens the tree up to allow sunlight penetration (important for fruit color) and air movement (important for disease management and pesticide coverage). Too much shading on peach twigs can kill the twig in one growing season and, eventually, no fruiting wood will be present in the lower part of the tree. 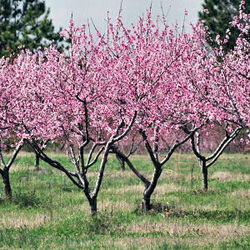 Some basic steps can be taken in pruning peach trees that will help the tree produce quality fruit. One of the first steps is to cut out most, if not all of the vigorous upright growth often called water sprouts. Fruit on this type of growth is usually of poor quality and water sprouts contribute greatly to shading lower branches. When cutting out upright growth, it is important to prune it all the way to the branch it originated from or else you will end up with more problems then when you started. Good video on Peach Tree pruning set to Beethoven.